Angled work surface and smaller base make the Cube Corner better suited for compact corner desks. Installation requires no assembly. Suspended keyboard tray increases the difference between monitor and keyboard, for better ergonomics than standard Varidesk. Height adjustment mechanism causes work surface to arc forward during height adjustment, forcing users away from their desk and reducing available floor space—particularly detrimental for compact workspaces. It has only eleven height settings, making it difficult to find an ergonomically suitable height for your wrists. Acceptable neck ergonomics are impossible without buying a $125 monitor arm accessory, bringing the final price to $620—more expensive than other, more advanced desktop risers. The Cube Corner cuts down on the Varidesk's traditionally bulky footprint with a triangular work surface designed to fit in compact office spaces. But despite these improvements over the original Varidesk, the Cube Corner still isn't up to par with other popular standing desk converters on the market, which have smoother height adjustment mechanisms and better ergonomics. 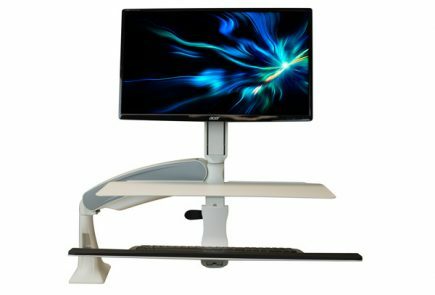 Its spring locking height adjustment system is a clunky holdover from the original Varidesk that makes it difficult to find the perfect height, while a $125 “optional” monitor arm is absolutely necessary if you want to work in a proper ergonomic posture. For its final $620 asking price, you can opt for much more advanced workstations with nifty features. Editor’s Note: The following is a “forensic” review. For this review, we rely on publicly-available information, as well as our own hands-on experience with the Varidesk Pro. As soon as we are able to conduct a hands-on evaluation of the product or learn new information about it, we will update this review. Learn more about our review process at Anatomy of a Review. When the Varidesk was first released in 2013, it was lauded for its easy height adjustability and sturdiness. In those early days, the competition was for the most part quite stale—standing desk converters were clunky, expensive, and ergonomically atrocious. The Varidesk, which at the time cost a mere $275 and could support up to 35 lbs. of weight was one of the most cost-effective solutions to converting your fixed-height desk to a sit-stand workstation. But competition has grown fiercer since those early days, and the Varidesk is now up against better-designed standing desk converters with a stronger focus on ergonomics. 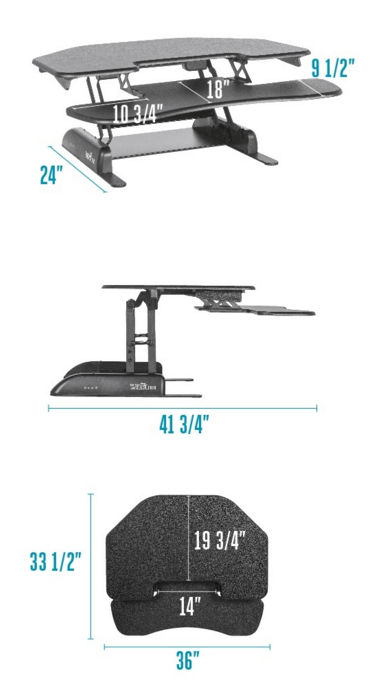 The Varidesk has a larger foot print than nearly every other standing desk converter on the market, and this excess bulk makes the Varidesk ill-suited for compact desks. Corner desks are particularly incompatible, as the Varidesk's rectangular design necessitates a rectangular table. To address these weaknesses, Varidesk has released a new line of standing desk converters specifically for cubicles and other compact office environments. This "Cube" series features a smaller footprint than the standard Varidesk model. 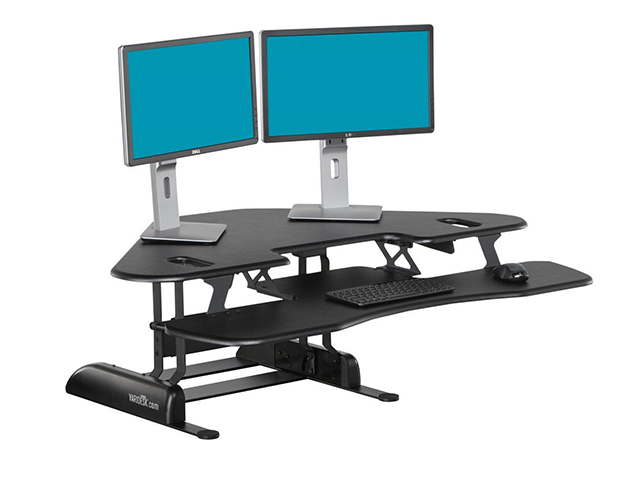 Not only that, but this series also includes two models specifically made for corner desks. In this review we'll be focused mainly on the Cube Corner, partly because it stands out more from the typical Varidesk design, and partly because we love a little alliteration. These Cube Corner models surmount one of the Varidesk's hurdles by providing a triangular work surface that is compact enough to fit in a corner, while retaining a sufficient amount of space for a keyboard and mouse. The Cube Corner also features the secondary typing platform that debuted with the Varidesk Pro Plus. But even with these improvements over the original model (now renamed Varidesk Pro), the Varidesk Cube Corner still possesses some of the same weaknesses that keep the Varidesk from claiming the top spot among today's standing desk converters. One perk that all Varidesk models share is that they are genuinely assembly-free. As a matter of fact, the most difficult part of the installation process is simply lifting the Varidesk and placing it on your desk, which we recommend doing with a friend, since it weighs between 60 and 63 lbs. After that it's all a matter of loading the top of the Varidesk up with your monitors, keyboard, and mouse. Unlike other standing desk converters like the Workfit-S or Quickstand Workstation, which require a desk-edge clamp or grommet mount to secure to your desk, the Varidesk relies on its heavy base frame to keep it anchored safely on top. We call it a 'free-standing' unit and you'll see this basic design on many desktop risers, such as the iMovR ZipLift, the Ergotron WorkFit-T, and Ergo Desktop's Kangaroo and Wallaby lines. This approach cuts down on assembly time, and it also better protects your desk, so you don't need to drill into the table top or risk a poorly-designed clamp scratching up the finish during installation. All Varidesks follow the same aesthetic: that is to say, none of them look particularly eye-catching. They all feature the same two designs: either all-black, or a two-tone design with white surfaces and gray-painted metal components. We don't much care for the Varidesk's work surface finishes, which have a rough stippled pattern that makes for a poor writing surface, unlike the similarly-built Workfit-T's elegantly smooth patina. The main design feature that sets the Cube Corner apart from other Varidesk models is its work surface, which has specially-angled sides built to fit seamlessly inside corners, providing more work surface space for corner desks. All Varidesk models have the same metal base frame, which houses the spring-locking mechanism that adjusts the work surface height. The Cube Corner's own metal frame is similar to the others, but has been cut down in width from 30" to 24". These 6 inches can mean all the difference when it comes to pairing this Varidesk model with a compact corner desk. But even with this change, the Cube Corner still isn't quite as compact as the likes of the Winston and Kangaroo, whose base plates never exceed 21 inches wide and are themselves purpose-built for corners. One of the advantages of this base frame is that it's firmly braced underneath the work surface, resulting in a stable work surface. 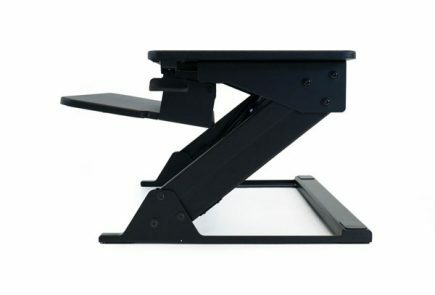 All standing desk converters experience at least some modicum of instability, and it's common for users to experience some wobbling or monitor shake when typing. 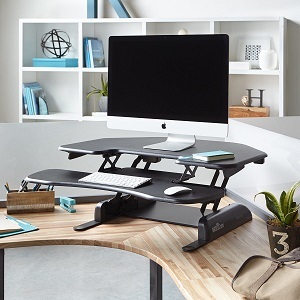 And although the Varidesk is not immune to this effect, it's far and away one of the most stable standing desk converters on the market, though it still doesn't stand up to the robust stability of the Kangaroo and Wallaby workstations. The Cube Corner uses the same height adjustment mechanism of the first Varidesk: a spring-loaded lever-locking system with eleven different height settings. Squeezing two hand levers underneath either side of the workstation releases the lock, while tightly coiled springs work to counteract your monitors' weight and help you lift the work surface. Release the lever and the work surface locks to the nearest height setting. This kind of height adjustment mechanism was once very common among standing desk converters, but has since fallen out of favor as more advanced gas-assisted and counterbalance lift systems have taken its place. There are a few reasons for this shift in popularity. First, lever locking systems tend to be noisy affairs, as they emit an audible (some of our testers would say oppressively audible) noise every time they lock in place. And we're not exactly thrilled at the thought of listening to the constant clanging of Varidesks in the office. Gas-assisted lift systems like the Kangaroo and Winston workstations, and counterbalance systems like Ergotron's Workfit-S and Humanscale's Quickstand all adjust smoothly and silently, resulting in a quieter office and happier co-workers. 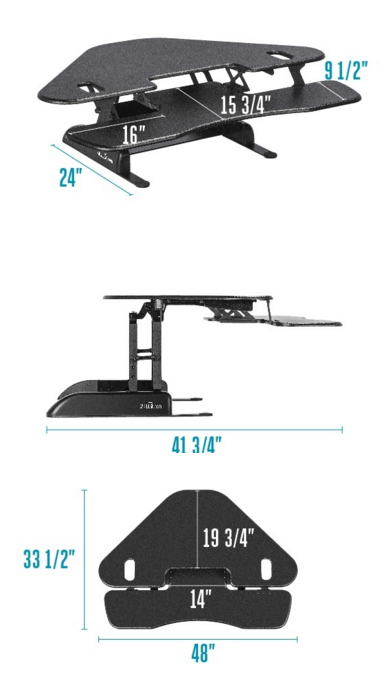 The Cube Corner's height adjustment mechanism also has another important flaw, one that is endemic to all Varidesk models: Whereas other standing desk converters adjust up and down in a straight line, the Varidesk work surface adjusts in an arc, moving towards the user the higher it goes. This is one of the most annoying aspects of the Varidesk as it forces you farther from your desk and, consequently, farther away from your materials and equipment. This arching tendency is an unpleasant inconvenience for most, but it's a serious disruption for people with little floor space to begin with—the very customers the "compact" Cube Corner is designed for. Gas-assisted and counterbalance mechanisms naturally avoid this kind of drawback, but so do other lever-locking systems like the Workfit-T and the Taskmate Go. This adjustment mechanism, an outmoded holdover from the original Varidesk, counteracts the Cube Corner's compact design and makes this supposedly "new" model seem clunky and antiquated compared to its competition. To work in ergonomic comfort, you'll need this monitor arm accessory. The Cube Corner's suspended keyboard platform, a feature carried over from the Pro Plus model, is a marked improvement over the original Varidesk's single work surface. The 3.5 inches of space between the monitor platform and the keyboard platform put you in a more ergonomically sound posture that better protects your wrists and neck from strain and fatigue as you work. But even with this improvement in place, it's nearly impossible to achieve proper ergonomics on the Varidesk. This is because, unlike other ergonomic standing desk converters, the Varidesk doesn't come standard with any sort of mounting column to keep your monitors raised to a proper height. Instead, you're expected to simply set your monitors on top of the work surface. This detrimental kind of configuration forces you to type with your arms and wrists bent like a t-rex, and to crane your neck down to look at your screen; none of which is healthy ergonomics. A day in this position is a recipe for neck, wrist, and arm pain. For you to really work comfortably and ergonomically on the Cube Corner, you will need an optional monitor arm. Built specifically for the Varidesk, this accessory clamps onto the edge of the work surface and provides a place to mount any VESA-compatible monitor. In a way, this monitor arm is actually better than the mounting columns of other standing desk converters. Not only does the monitor arm provide 20.5" of height adjustment, it also lets you move your monitor horizontally or swivel it to the side. Unfortunately, this ergonomic attachment comes with a sobering $125 pricetag, bringing the total price of the Cube Corner to at least $620, well above the price of comparable workstations. For that price, you can buy two Wallaby Juniors and still have money left over to treat yourself to a nice steak dinner, sans the wine pairing. Seeing as the monitor arm is more necessary than optional, this high price is unavoidable with the Cube Corner, and not worth what few features it offers. We recommend checking out the iMovR ZipLift, which comes at a bargain price for its rock solid stability and ergonomic features, the WorkFit-T, or the Kangaroo line, along with a host of other risers you can read more about in our Comparison Review. A lot of people are unaware that there are excellent electric desk options for corner denizens. These are even usable in cubicles, by simply removing the tabletops that are usually simply hanging off the slat rails of the cubicle walls. The corner standing desks from iMovR come in nine different sizes to integrate with the vast majority of users' corner and cubicle corner space limitations. The Cube Corner attempts to make the Varidesk more user-friendly for office workers in compact workspaces—and especially those who work at small corner desks—but falls short on a few fronts. Its height adjustment mechanism's side effect of protruding outward as you adjust its height is aggravating. Also annoying is its eleven height settings, which make it difficult to set your work surface to precisely the right height you need to work comfortably. 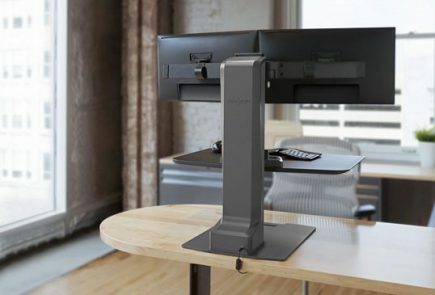 If you want to use the Cube Corner ergonomically, you will need a $125 monitor arm accessory, which brings the Cube Corner—already a pricey item to begin with—to $620, way beyond the price range of many better-performing standing desk converters. If you're looking for a workstation that you can install in your corner desk or other compact work space, check out the Kangaroo or the Flexispot M4, which offer more advanced features than the Cube Corner, and at a price point. 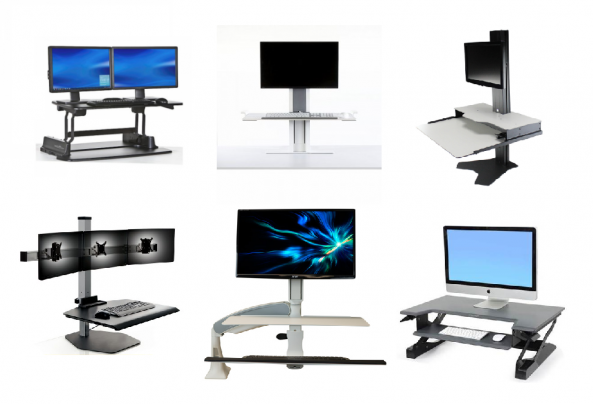 See our comprehensive round-up of Standing Desk Converter Reviews to learn about all the competing products in the market, and our Varidesk Reviews to compare this model to the others from the same manufacturer. Want to Sell A Used Varidesk? There's a lot of people in the same boat as you. Check out our brief article for tips. Hello, My Varidesk cube corner 36 is very difficult to raise. Is this normal?